Farthingale established 1988, are a family business of costumiers, supplying to museums, re-enactors, Tv, and of course many private clients and collectors. We make costumes from all era''s and all styles, please be aware that there is very little on the site compared to what we can actually produce for you so if you don''t see what your looking for then please contact us with any questions or requests. 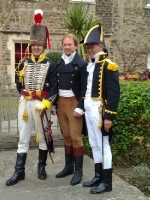 Also be sure to check out the Regency Ball, and Events pages to see what we''re involved in, in the coming year. Grand Regency ball and supper 2019, Sunday September 22nd, at the Assembly rooms, Bath. Atfter the success of our 2018 Grand Regency Ball tickets are now on sale for the 2019 Farthingale Grand regency ball and supper. The support of our returning customers is always greatly apreciated, and we look forward to welcoming you again, along with any and all the new comers who wish to come and give it a try. See you in September. Unusually for certain circumstances the ball will be on a Sunday this year, the ball is on Saturday again in 2020, so this is just for one year, but why not, let's all have a party on a Sunday for once!